Warner Brothers Interactive Entertainment and DC Entertainment unleashed today the first of three brand new gameplay videos on the highly anticipated Batman: Arkham Knight. The video which has been titled: The Official Batman: Arkham Knight – Ace Chemicals Infiltration – Pt. 1 and can be found here or the video below. The video shows Batman inspecting his new foe and utilising new abilities to learn about the enemy as he enters ACE Chemicals. There are also some brand new features added to game, such as the new Fear Takedown manoeuvre, as well as the flawless integration of the Batmobile, which has been added into gameplay and can also be used in combat mode. This instalment of the award-winning Arkham Trilogy, brought to you all by Rocksteady Studios will bring the franchise to an epic close. Which means in this explosive finale Batman will have to fight a force that threatens the whole city that he has sworn to protect. As Scarecrow returns and attempts to reunite the super criminals of Arkham. 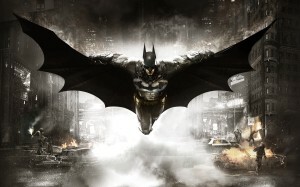 Batman: Arkham Knight has been specifically designed for the next gen consoles and the PC. and the release date for the final instalment is, June 2, 2015.